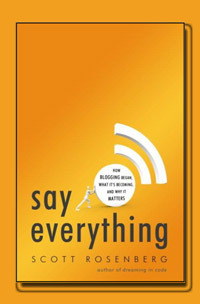 “Say Everything: How Blogging Began, What It’s Becoming and Why it Matters” by Scott Rosenberg; $26, CrownPublishing.com. Joy likes this book, which is both a reminiscence and musings about the future of the Internet. Rosenberg was a co-founder of Salon.com, one of the first online magazines. He reports on what he saw around him as the computer revolution took off. He was 15 in 1974 when Ray Kurzweil, a pioneer in voice recognition, music synthesizers and text-to-speech systems, brought a refrigerator-sized computer to his friend’s house. Rosenberg and the friend used it to publish a magazine for fans of a game called Diplomacy.